Minister for Housing Eoghan Murphy TD, Minister for Health Simon Harris TD and Kate O'Connell TD in the RDS, Dublin at the count this May. ABORTION LEGISLATION HAS passed through the Dáil. The vote on the Health (Regulation of Termination of Pregnancy) Bill came at the end of day’s of debate in the Dáil on the stroke of midnight. The Bill passed by 90 votes to 15, and will now pass onto its next stage in the Seanad. The fact the Bill has passed means that it is keeping within the timeline so that abortion services can be introduced in Ireland in January. Minister for Health Simon Harris said in a statement that it’s a “really significant step forward”. The Eighth Amendment referendum in May of this year paved the way for the legislation to be brought in. That referendum repealed the Eighth Amendment, meaning that planned legislation to regulate termination of pregnancy was to be brought in. The process to bring in the legislation was delayed due to a number of court challenges to the result of the Eighth Amendment vote. The Dáil proceedings today were also lengthy and often heated as a number of TDs debated amendments to the proposed legislation well into the night. 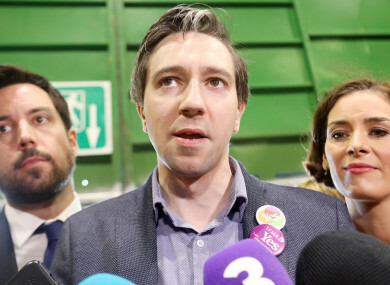 Conscientious objection was a major contentious point during the debate, over Minister Harris’ plans to introduce GP-led abortion services from January 2019. The legislation makes provision for this and says anyone wishing to exercise conscientious objection should “make such arrangements for the transfer of care of the pregnant woman concerned as may be necessary to enable the woman to avail of the termination of pregnancy concerned”. In other words, the medical professional would have to refer the case onwards. TDs who’d campaigned to retain the Eighth Amendment spoke referenced conscientious objections a number of times, such as former Sinn Fein TD Peadar Tóibín who said that abortion services are being imposed on GPs, and claimed hundreds of GPs do not believe that general practice was the appropriate setting to lead these services. He said doctors, nurses and pharmacists who are concerned about the proposals were denied a consultation with Minister Harris. Former Fine Gael TD Peter Fitzpatrick argued for an opt-in system while Fianna Fáil’s Mary Butler said medical practitioners had genuine concerns. Harris replied that there are many doctors willing to provide these services, adding that he would defend conscientious objection “forever to anyone”. He said: “We had a referendum on women and women’s healthcare and maybe we should think about the woman. I will defend forever the right of a doctor or healthcare professional to object conscientiously, but I will not stand over conscientious obstruction. TDs such as Ruth Coppinger and Bríd Smith spoke against the amendments during the lengthy debate. Smith in particular took exception to Tóibín’s comments about how a consultation over hedge cutting would take a year. “Is it getting that ridiculous and inhumane? We need a reality check and to think about what we are saying,” she said. Amendments proposed to the legislation on conscientious objection were rejected by the Dáil, as was an amendment on the disposal of foetal remains. In his statement, Harris hailed the passing of the legislation as a “new era for Irish women”. “I can only imagine how the intensity of debate during the campaign and since then has felt for women who have themselves travelled abroad for a termination over many years,” the Minister said. Who felt the cold shoulder of judgment and the sting of shame at home, and the isolation of being alone and vulnerable abroad. They don’t forget, but the referendum result let a little welcome light into the shadows that were forced on their lives. I look forward to a time – not far away now – when we will be able to assure women experiencing crisis pregnancies that they will be looked after here at home, where they need not fear that they will be stigmatised for their choices or lack the support they and their families need from our health service. The next step for the Bill is to now go to Seanad for consideration, with a tight deadline in place to get it through before the Dáil breaks for Christmas next week. Email “The legislation legalising abortion in Ireland has been passed by the Dáil”. Feedback on “The legislation legalising abortion in Ireland has been passed by the Dáil”.